Download "Omega-3 Fatty Acid Products"
3 adverse events (AEs) include dyspepsia, eructation, taste perversion, and arthralgia. Both agents have it noted in their prescribing information that the effects on the risk for pancreatitis, as well as the effect on cardiovascular (CV) mortality and morbidity, have not been determined. 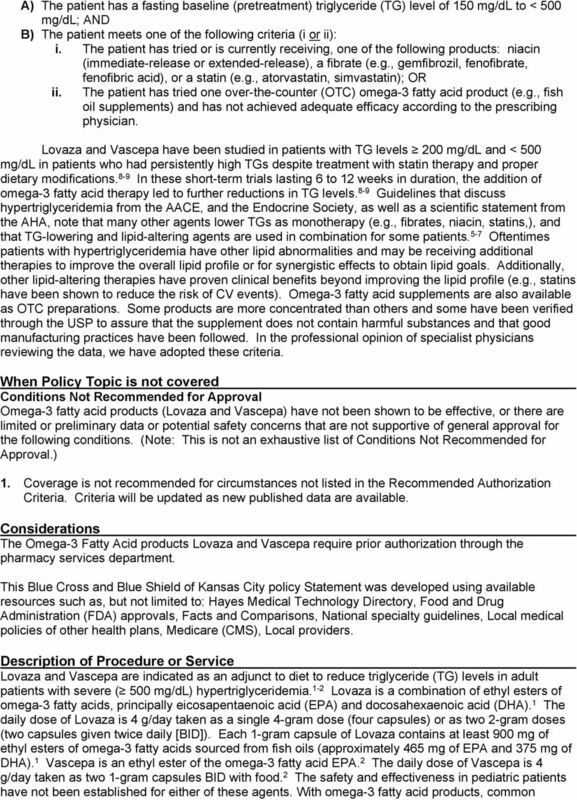 Of note Epanova (omega- 3-carboxylic acid capsules) and Omtryg (omega-3-acid ethyl esters A capsules) are two other omega- 3 fatty acid products that were approved by the FDA with similar indications but have not been marketed yet. 3-4 They are not discussed further in this document. Rationale Guidelines/Scientific Statements American Heart Association (AHA) In 2011, the AHA published a scientific statement regarding TGs and CV disease. 5 Approximately 31% of patients in the US have TG values 150 mg/dl. Very high TG values ( 500 mg/dl) only occur in 1% to 2% of patients. TG levels associated with a risk of TG-induced pancreatitis are usually 1,000 mg/dl. Many lipid-lowering therapies decrease TG levels. As monotherapy, fibrates have demonstrated the strongest TG reduction (30% to 50%), followed by immediate-release niacin (20% to 50%), omega-3 methyl esters (20% to 50%), extended-release niacin (10% to 30%), statins (10% to 30%) and Zetia (ezetimibe tablets) [5% to 10%]. Therapeutic lifestyle changes (e.g., proper nutrition, exercise and weight loss [if needed]) can reduce TG values by up to 50%. If patients have elevated low-density lipoprotein cholesterol (LDL-C) and elevated TG levels, statin therapy may be beneficial. Use of 4 g of marine-derived omega-3 polyunsaturated fatty acid (PUFA) per day decreased serum TG concentrations by approximately 25% to 30%, along with increases of 5% to 10% in LDL-C and 1% to 3% in high-density lipoprotein cholesterol (HDL-C). There is an approximate 5% to 10% reduction in TGs for every 1 g of EPA/DHA consumed and efficacy appears greater in patients with higher pretreatment TG levels. 4 American Association of Clinical Endocrinologists (AACE) In 2012, the AACE developed guidelines for the management of dyslipidemia and prevention of atherosclerosis. 6 TG levels < 150 mg/dl are optimal for patients. Fibrates are recommended for the treatment of severe hypertriglyceridemia (TG > 500 mg/dl). Niacin can be used for TG reduction, increasing HDL-C, and reducing LDL-C. For both medications, adjunctive use of 2 to 4 g/day of omega-3 fish oil can be used, if needed, to obtain TG goals. Omega-3 fatty acid (fish oil) supplementation is effective in reducing TG, with studies showing reductions of 30% to 50%. Also, combination therapy with niacin or fibrates with statins may be appropriate for patients with hypertriglyceridemia and related low HDL-C. Considerations with statin therapy include monitoring of liver function, and awareness that myalgias and muscle weakness occur in some patients. Some statins have a potential for drug-drug interactions; myopathy or rhabdomyolysis may occur in rare cases, but the risk is increased when given with certain medications. Albeit rare, fibrates (i.e., gemfibrozil, fenofibrate, fenofibric acid) may lead to myopathy and rhabdomyolysis; the risk is increased when used with a statin (interaction less likely with fenofibrate or fenofibric acid). Fibrates may increase serum creatinine levels and are associated with gastrointestinal (GI) symptoms. Niacin has the potential for frequent skin flushing, pruritus, abdominal discomfort, hepatoxicity, nausea and peptic ulcers. Niacin may also have effects on serum glucose (diabetes) at higher dosages, as well as increases in uric acid levels, which may lead to gout. Endocrine Society In 2012, the Endocrine Society 7 published a clinical practice guideline regarding the evaluation and treatment of hypertriglyceridemia. Lifestyle changes, including dietary counseling, physical activity, and weight reduction (if needed) are essential in the treatment of mild to moderate hypertriglyceridemia. The guidelines note that fibrates should be strongly considered for patients with severe and very severe hypertriglyceridemia and should be considered in those with moderate hypertriglyceridemia. Fibrates decrease TG levels by 30% to 50%. At doses of 500 to 2,000 mg/day, niacin lowers TGs by 10% to 30%, increases HDL-C by 10% to 40%, and lowers LDL-C by 5% to 20%. Niacin can lead to cutaneous flushing, hepatotoxicity (which is dose dependent), and impairments in glucose tolerance. Long-chain marine omega-3 fatty acids (EPA and DHA) lower fasting and postprandial TG levels in a dose-dependent manner. Approximately 3 to 4 g/day of EPA plus DHA reduce TG levels by 20% to 50%. Reductions in TG levels can increase the levels of LDL-C. No studies using high-dose omega-3 fatty acids in hypertriglyceridemia have shown beneficial CV outcomes. 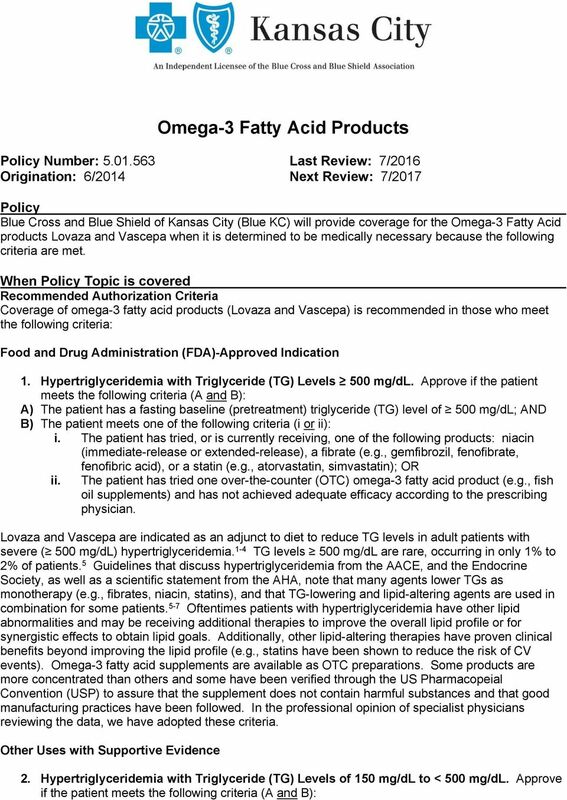 Omega-3 fatty acids (e.g., Lovaza) may be considered for treating TG levels > 1,000 mg/dl. Over-the-counter (OTC) preparations of omega-3 fatty acids have variable quantities of EPA and DHA ranging from 20% to 50%, depending on the products. The nutrition labels should be evaluated to calculate the number of capsules required. Lovaza, at a dose of four capsules, lowers TG levels by 30% to 50%. AEs with large doses of omega-3 fatty acids include fishy taste and burping. 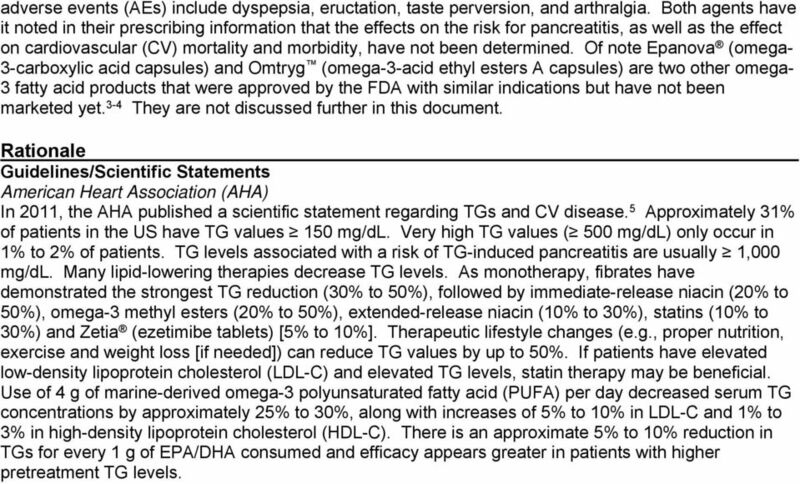 Statins have modest TG-lowering effects (10% to 15%), which appear to be dose dependent. High doses of statins (atorvastatin 80 mg or Crestor [rosuvastatin tablets] 40 mg) can lower plasma TG levels by 25% to 30%. Statin monotherapy should not be used first-line to reduce TG levels in patients with severe or very severe hypertriglyceridemia (> 1,000 mg/dl). Adding statin therapy may be considered to reduce CV risk in patients with mild to moderate hypertriglyceridemia (TG > 150 mg/dl and < 1,000 mg/dl). 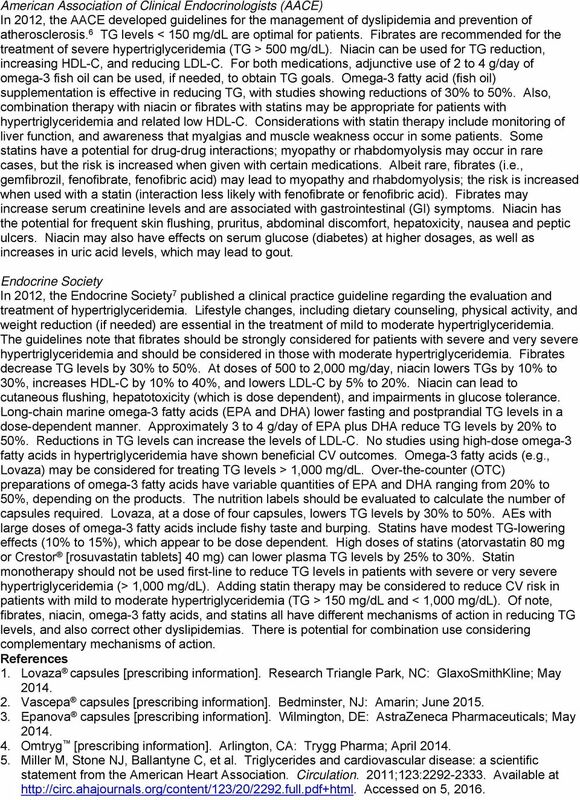 Of note, fibrates, niacin, omega-3 fatty acids, and statins all have different mechanisms of action in reducing TG levels, and also correct other dyslipidemias. There is potential for combination use considering complementary mechanisms of action. References 1. Lovaza capsules [prescribing information]. 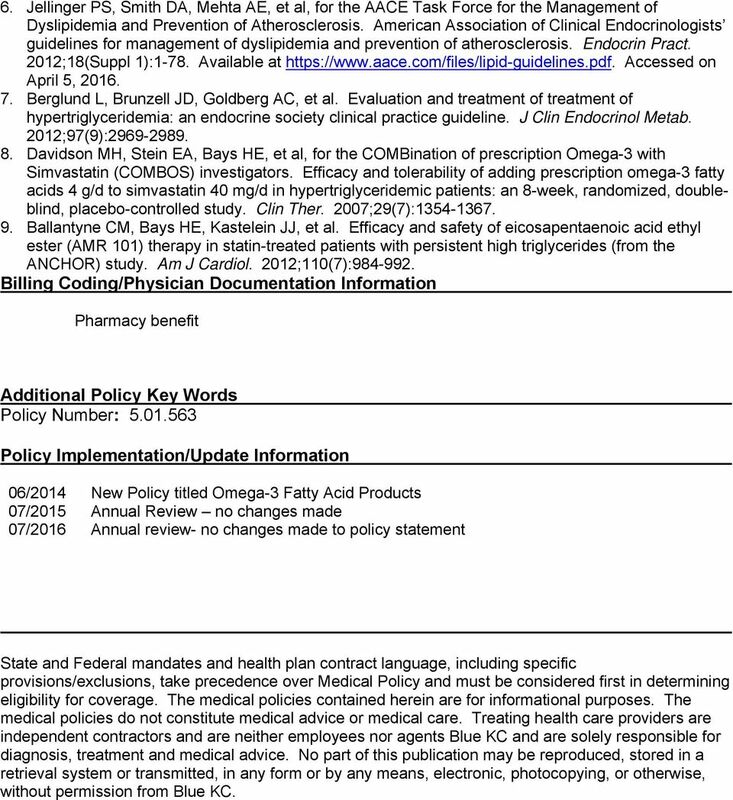 Research Triangle Park, NC: GlaxoSmithKline; May Vascepa capsules [prescribing information]. Bedminster, NJ: Amarin; June Epanova capsules [prescribing information]. Wilmington, DE: AstraZeneca Pharmaceuticals; May Omtryg [prescribing information]. Arlington, CA: Trygg Pharma; April Miller M, Stone NJ, Ballantyne C, et al. Triglycerides and cardiovascular disease: a scientific statement from the American Heart Association. Circulation. 2011;123: Available at Accessed on 5, 2016. 5 6. Jellinger PS, Smith DA, Mehta AE, et al, for the AACE Task Force for the Management of Dyslipidemia and Prevention of Atherosclerosis. American Association of Clinical Endocrinologists guidelines for management of dyslipidemia and prevention of atherosclerosis. Endocrin Pract. 2012;18(Suppl 1):1-78. Available at Accessed on April 5, Berglund L, Brunzell JD, Goldberg AC, et al. Evaluation and treatment of treatment of hypertriglyceridemia: an endocrine society clinical practice guideline. J Clin Endocrinol Metab. 2012;97(9): Davidson MH, Stein EA, Bays HE, et al, for the COMBination of prescription Omega-3 with Simvastatin (COMBOS) investigators. Efficacy and tolerability of adding prescription omega-3 fatty acids 4 g/d to simvastatin 40 mg/d in hypertriglyceridemic patients: an 8-week, randomized, doubleblind, placebo-controlled study. Clin Ther. 2007;29(7): Ballantyne CM, Bays HE, Kastelein JJ, et al. Efficacy and safety of eicosapentaenoic acid ethyl ester (AMR 101) therapy in statin-treated patients with persistent high triglycerides (from the ANCHOR) study. Am J Cardiol. 2012;110(7): Billing Coding/Physician Documentation Information Pharmacy benefit Additional Policy Key Words Policy Number: Policy Implementation/Update Information 06/ / /2016 New Policy titled Omega-3 Fatty Acid Products Annual Review no changes made Annual review- no changes made to policy statement State and Federal mandates and health plan contract language, including specific provisions/exclusions, take precedence over Medical Policy and must be considered first in determining eligibility for coverage. The medical policies contained herein are for informational purposes. The medical policies do not constitute medical advice or medical care. Treating health care providers are independent contractors and are neither employees nor agents Blue KC and are solely responsible for diagnosis, treatment and medical advice. No part of this publication may be reproduced, stored in a retrieval system or transmitted, in any form or by any means, electronic, photocopying, or otherwise, without permission from Blue KC. Pharmacy Coverage Guidelines are subject to change as new information becomes available. Triglycerides are an important measure of heart health. Here's why triglycerides matter and what to do if your triglycerides are too high. September 2014. Strategy or Medications Added or Modified Remove belladonna alkaloidsphenobarbital. Therapeutic Class/Drug Name. Management of Lipids in 2015: Just Give them a Statin? CHOLESTEROL 101: WHAT YOU NEED TO KNOW TO KEEP YOUR HEART HEALTHY. By: Camille Quiles, PharmD., RPh. Supplements, Vitamin D, Omega-3 Fatty Acids, and Co-Enzyme Q10: What Really Works? Immediately below, for your personal edification, are some of the questions that I ve been fielding from various retail settings. AHA/ASA Guidelines on Prevention of Recurrent Stroke MARA LAMBERT Guideline source: American Heart Association/American Stroke Association Evidence rating system used? Yes Literature search described? Oxfordshire CCG Lipid Management Guidance Updated April Inside this issue: guidelines. Prescribing Points A NEWSLETTER FOR ALL HEALTH CARE PROFESSIONALS IN OXFORDSHIRE, WRITTEN BY THE MEDICINES MANAGEMENT TEAM, OXFORDSHIRE CCG, JUBILEE HOUSE, OXFORD BUSINESS PARK SOUTH, OXFORD, OX4 2LH. JNC 8 & Cholesterol 11/12/2014 NCEP-III. Where d those target LDLs come from? Lessons from Zetia. It s all about that bass dose! EZETROL (ezetimibe) PRESCRIBING INFORMATION Refer to Summary of Product Characteristics (SmPC) before Prescribing Adverse events should be reported. Reporting forms and information can be found at www.mhra.gov.uk/yellowcard. Lipid-lowering: Can ezetimibe help close the treatment gap? ROLE OF LDL CHOLESTEROL, HDL CHOLESTEROL AND TRIGLYCERIDES IN THE PREVENTION OF CORONARY HEART DISEASE AND STROKE I- BACKGROUND: Coronary artery disease and stoke are the major killers in the United States. Doubts surrounding Complementary and Alternative Medicine. Arnaldo E. Pérez Mercado, M.D. Omega-3 Bioavailability: Is One Form of Omega-3 More Bioavailable than Another?